You’d be hard-pushed to find a football supporter who rates Joe Kinnear in today’s football world. He slags off his team’s fans, claiming he has “more intelligence” than them, yet struggles to harness a basic command of the English language. Once upon a time, Kinnear did a good job at Wimbledon, when simple spit and elbow grease could get results, but now in the context of the modern game, he’s regarded as an out-dated cross between Barry Fry and Dave Bassett. Kinnear’s attempts to sign Darren Bent for £2.50 and a bag of crisps, didn’t exactly adhere himself to Villa fans or enhance his credentials as Newcastle’s football director. In his own words, he’s somebody “who can pick the phone up and speak to any manager”, but I’m pretty sure Lambert is ex-directory when it comes to Kinnear. 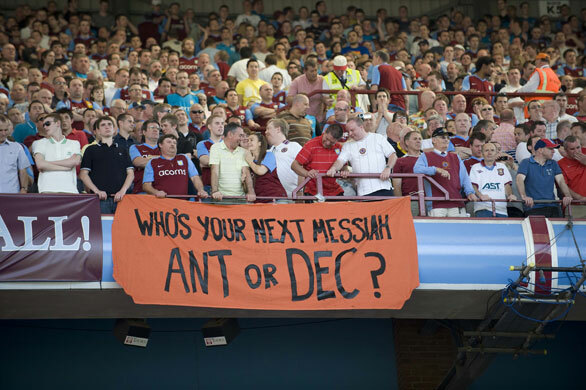 Newcastle are next up at Villa Park (after the international break) and the fixture always produces memories from over the years of Villans winding up our friends from the north, who seem to have a phobia to winning trophies. If there was ever a reason for Villa supporters to knock-up another banner in the name of Geordie baiting, it would have been to take the mickey out of Newcastle’s unfortunate employment of Joe Kinnear. But before you go and grab the sheet off your bed and make a Joe Kinnear banner, it seems that the Toon Army have beaten us to the punch, if the below picture is anything to go by. 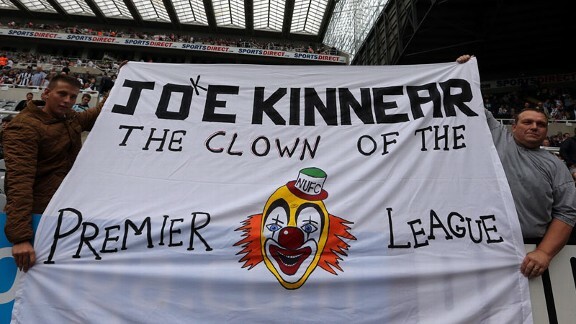 Credit where it’s due, the Toon Army’s Joe Kinnear banner is a cracker – especially the touch of the inserted ‘K’ to turn Joe to Joke. Unfortunately, it was taken off Newcastle fans at the game against West Ham over the weekend by stewards. If the Geordie Nation can get it back, we’ll gladly fly it for them from the Holte End when Newcastle come to town. Thanks for saving us a job of making it, as drawing that clown looks like it could have been particularly tricky.